Just off Brixton Hill this recently opened Nepalese restaurant, with its vibrant modern interior, specialises in true Asian cooking. The preparation of the food varies from region to region but the common factor is the use of fresh herbs and spices which enhance rather than overwhelm the flavour of the dishes. 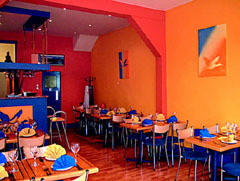 Chef/owner, Krishna, prides himself on preparing unique dishes from the Chuli (clay oven) cooked over charcoal, together with a range of modern Nepalese dishes and daily specials. Open Tue-Sun 6pm-11pm. All major credit cards accepted (not Amex/Diners). No service charge. Authentic Asian cooking with unique dishes for you to experience this delicious cuisine.